Summary: Following families and characters as diverse as working class laborers and chateau-dwelling aristocrats, the novel Paris by Edward Rutherfurd sweeps from the middle ages through World War II. One character yearns to join the Knights of the Templar, another helps build the Eiffel Tower, and a third spies on the occupying Germans while running a high-class brothel. Throughout the story, Paris develops, seduces, and matures alongside the human characters. Thoughts: In the middle of last year’s trip to Ireland, a fellow traveler gave me a copy of Edward Rutherfurd’s Ireland Awakening (Book Review: Ireland Awakening by Edward Rutherfurd) which proved to be a splendid travel companion. 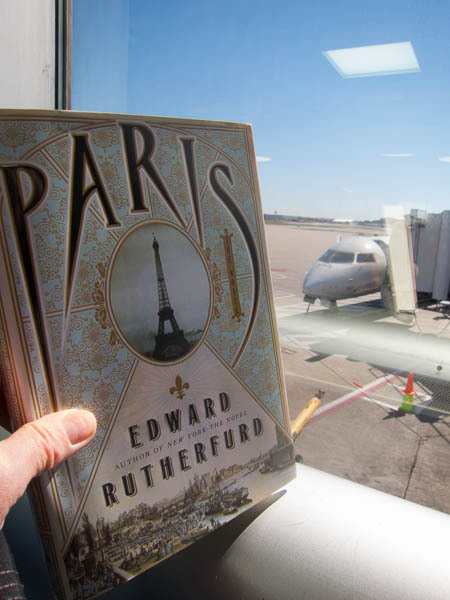 Just a few days before leaving on our trip to France, I realized that Rutherfurd’s latest book had just been published and it was called Paris. I had to have a copy. Since I struggle with reading e-books, still, especially long ones, I went ahead and bought the hardback even though it added several pounds to my luggage. I began reading the novel while waiting to board our plane in St. Louis Lambert Airport to take us to Charles De Gaulle airport via JFK in New York City. I read it for many hours of that 40+ hour day, on planes and in airport chairs and on the tour bus. I continued reading during the bus rides between gardens and chateaus west of Paris and in the Loire Valley. I hadn’t finished yet by the time our tour ended in Paris and we had four days on our own. What fun to read about the French sabotage of the Eiffel Tower’s elevator system before Hitler’s visit on the day of our visit to the famous landmark. Enjoying the 19th and 20th century art in the Musée d’Orsay and the Musée de l’Orangerie took on extra meaning after living in the art world of Paris through this novel. I finally finished this monster of a novel the night before we left Paris. The cover of the novel matched the accessories in our Paris hotel room — gold and that lovely shade that I’m going to forever think of as Paris blue. 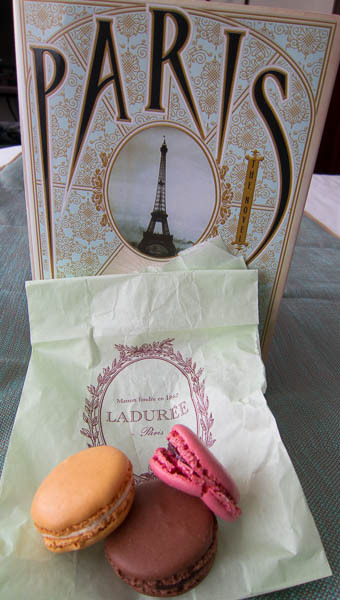 Here’s a photo of the book with some macarons from Ladurée. I might have left the book in France for another traveler but my mother-in-law recently discovered Rutherfurd (she was reading Sarum when we left — Book Review: Sarum by Edward Rutherfurd) so I brought it back home to lend to her. Appeal: This is a book for lovers of historical sagas and for Francophiles. Challenges: This is my fifth book for the Books on France challenge. I originally pledged three but I’m still reading books on France. I’ll also link this review (and maybe some other posts) to the Monday meme at An Accidental Blog called Dreaming of France. How do books and travel work for you? I just finished it this week too. I want to read the book however I really want one of those macarons. I have Paris to the Pyrenees waiting to be read. Oh my we do like the same things!! I looked for this elephant we were in Rome and was delighted to get to see him. Thanks for dropping by and visiting me!! I love planning my holiday reading, nearly as much as planning my holiday. I won’t be taking Paris with me, although I am interested in reading it, I’m not all that good with huge books, and I’ve already got my holiday reading planned. I’ve got one new Australian book saved for the first flight, and then Les Miserables and Elegance of the Hedgehog for my Paris reading. I’m sure I won’t get through most of it- well done for actually finishing yours- it sounds wonderful. I really like to pack as light as possible, which I why I have learned to fall in love with my e-reader. I can carry an entire library and it weighs nothing. The only downside is they don’t let you read it during take-off or landing so I still have to carry something in print which is a pain. The macarons look divine, by the way. You and Carol and driving me crazy this morning with macaron envy.